Archives : UPSIDE TASUKI GAP - 20/09/2013. UPSIDE TASUKI GAP – 20/09/2013. SURPRISE MOVES BY CENTRAL BANKS. In what can be described as a study in contrast, both the US Fed and the RBI chose to act in contrasting manner. Just when everyone expected the US Fed to take its first step towards slowing down the economic stimulus, it sprang a surprise by maintaining status quo and refrained from QE tapering. The market cheered this news by climbing more than 3.5% on Thursday. Just when the market expectations were further raised, the RBI Governor chose to surprise the market by raising interest rates to combat rising inflation. The market reacted negatively but somehow ended the day off the lows. After witnessing a stupendous rally of more than 3200 points on the Sensex and 1000 points on the Nifty, finally the market has chosen to retrace and rest for a while. 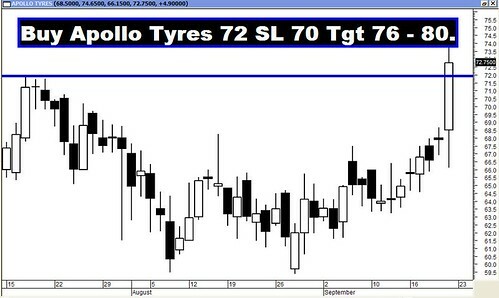 The candlestick formation on the daily charts on Friday as well as weekly charts, suggest a bullish continuation pattern and hence this rally has yet not peaked out. May be the market might enter a small consolidation phase before resuming the strong uptrend. The Correction levels will be 5751-5630-5510 for the Nifty. Sensex opened the week at 19977, made a high of 20739, low of 19596 and closed the week at 20263. Thus it registered a weekly gain of 531 points. At the same time the Nifty opened the week at 5930, made a high of 6142, low of 5798 and closed the week at 6012. Thus the Nifty closed the week with a gain of 162 points. On the daily charts, both Sensex and Nifty have completed an Upside Tasuki Gap formation. The black body candle on Friday did not completely fill the gap between Wednesday’s and Thursday’s candle, which led to the formation of Tasuki Gap. This suggests that the gap will continue to act as support and the prior trend should continue. This pattern can fail only if Sensex closes below 20013 and Nifty below 5916. On the weekly charts, both the indices have formed a white body candle with long upper and lower shadows. The long upper and lower shadows are due to the high volatility witnessed this week. Thus both daily as well as weekly charts suggest continuation of bullishness in the near term. In the case of Sensex going below 20013 and Nifty below 5916, then one can expect the market to enter a corrective phase. For this, one has to consider the retracement of the entire rise from Sensex 17448 to 20739 and Nifty 5118 to 6142. The corresponding Correction levels are 19482-19094-18705 for the Sensex and 5751-5630-5510 for the Nifty. Last week, both the indices formed an Upward Rising Gap between Sensex 19293 – 19444 and Nifty 5688-5738. This gap has not only been formed on the daily charts but also on the weekly charts, hence it will provide strong support to the market. Also the presence of 200dma for the Sensex (19385) and 50dma for the Nifty (5721) inside this gap, will add to the strength of the support. The above mentioned Gap is also a Measuring Gap (Sensex 19293 – 19444 and Nifty 5688-5738) in the current upward rally (the rally has started from a low of Sensex 17448 and Nifty 5118). If this gap holds, then as per Gap theory, the target for the upward rally works out to be Sensex 21289 and Nifty 6308. Both Sensex and Nifty are already above the short term average of 20dma (Sensex – 19196 and Nifty – 5662), medium term average of 50dma (Sensex – 19282 and Nifty – 5721) and the long term average of 200dma (Sensex – 19385 and Nifty – 5842). Thus the trend in the short term, medium term and long term timeframe continues to remain positive. MACD and ROC are both positive and continue with its Buy signal. RSI (62) continues to stay above the equilibrium line suggesting bullish momentum. Similarly MFI (57) continues with its Buy signal as it is above the centerline which suggests money flowing into the market. Stochastic Oscillator continues with its Buy signal (%K above %D) despite being in overbought territory (%K @ 90). Stochastic Oscillator has been overbought for around two weeks. ADX has increased and is at 23 suggesting uptrend being developed. The Directional Indicators continue with its Buy signal as +DI remains above -DI. OBV continues in Buy mode, making higher top higher bottom formation. Bollinger band continues with its Buy signal given in previous week. Thus majority of the Oscillators are pointing towards more bullishness in the short term. The Nifty O.I. PCR suggests bullishness and is at 1.64. For the current month series, highest Open interest build up is at 5300 Put and 6000 Call. This suggests that the market expects a wide trading range with support coming in at 5300 levels and resistance around 6000 levels. Friday saw high amount of Put writing at 5600 strike which suggests immediate support coming in at around Nifty 5600 levels. The Trendline Resistance for the Sensex is at 21007. The Trendline Support for the Sensex is at 20050. The Trendline Resistance for the Nifty is at 6214. Trendline Support for the Nifty falls at 5972. For the week ahead, Sensex will find Support at 19962-19596-19293 and will find Resistance at 20553-20854-21108. For the week ahead, Nifty will find Support at 5916-5798-5688 and will find Resistance at 6133-6229-6338. All the Recommendations of previous week reached their targets with ease. However the Star Performers of the week were Bank of Baroda and Reliance Infra which went up by more than 10% and 9% respectively!! !